When I read Andrew Nurse’s first post for the Beyond the Lecture series, I was both delighted and frustrated. Delighted because I continue to believe that, as academic historians, we have an obligation to think more seriously about the craft of teaching; frustrated because how far behind we Canadians are in this reflective process. This is one reason why the series is so welcome. 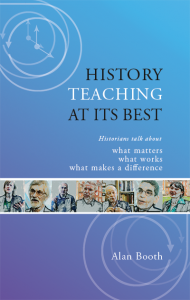 Four years ago, Alan Booth, an emeritus professor of history at the University of Nottingham and co-founder of the web resource, www.historiansonteaching.tv, published History Teaching at its Best: Historians talk about what matters, what works, what makes a difference. It used survey data from questionnaires completed by nearly 10% of all history professors employed as academics in the UK, along with semi-structured interviews with historians with a keen interest in teaching from Britain, Australia, the US, and mainland Europe, to launch a broader conversation about teaching within our discipline. Cover of Booth’s History Teaching At Its Best. The key point is this: Booth laments what he sees as historians’ collective ambivalence with regard to the Scholarship of Teaching and Learning but also feels that historians are open to internal discussion and debate within the discipline. His book traces the unwillingness of historians to think about learning as a science to the professionalization of academic history after the Second World War. As published research became the key to professional success, a belief appears to have developed among historians that linked active research to effective teaching. This belief – based, paradoxically, entirely on anecdotal evidence, something historians would never allow to go unquestioned in their own scholarship – spread rapidly. “Even the notion of a need for training in teaching,” writes Booth, “was often contested as an attack on craft-based expertise, on academic freedom, and on the intensely personal and private nature of classroom teaching” (28). Because of this, it is difficult to imagine historians seeing a significant role in their lives for a Society for Teaching and Learning in Higher Education (STLHE). I would explain it like this: most academic historians still see themselves as teachers of history. In STLHE, most of us see ourselves as teachers of students. Booth’s chapter 3, on “love, passion, and motivation,” is illustrative of the profound difference between the two views. In his conversations with historians, they tell him that “Passionate teaching – teaching that is committed, caring and purposeful – is closely bound up with love of the subject” (44). I have to confess that I struggle with this assertion, and I suspect that some of my colleagues with inter-disciplinary backgrounds do too. My own experience, at least, does not seem to bear this out. I have a PhD in history, and I taught history at two Ontario universities for a number of years, but today I teach “defence studies” as part of a graduate program in public administration. I have no background in defence nor in public administration. I took a single, second-year course in Canadian political science as an undergraduate. My inter-disciplinary MA in international affairs included one additional course that might fit within a public administration program. I have never published in the Canadian Journal of Public Administration, have never taken a research methods course in political science, and continue to write books that are historical in their orientation. If we follow Booth, given my lack of professional commitment to public administration, I should struggle to teach my course in Canadian government and strategic decision-making effectively. Most of the lectures that I give and seminars that I facilitate – on inter-departmental cooperation, federal-provincial-Indigenous relations, Canadian multiculturalism, US government, international development assistance – are new to me. I have started from scratch, consulted with better-informed colleagues, and learned on the go. Yet my students’ response to my teaching appears to be no different than it was when I taught history. The techniques that students appreciated in years past are still welcomed today. My weaknesses, while hopefully less prominent after more than a decade in classroom and a long-standing immersion in the scholarship of teaching and learning, remain similar. In my experience, passionate teaching is less about love of the discipline in which you’ve been trained than it is bound up with a personal, empathetic commitment to student learning. My students today are senior Canadian and international military personnel and public service executives. I believe that the questions that we explore together are important to their careers, and I feel a responsibility to provide them with the best possible opportunity to learn. Sometimes that means going heavy on the history; sometimes it doesn’t. Whether my students become better historians, or better-versed in the scholarship of Canadian public administration for that matter, has never been my priority. When I taught history courses to undergraduates at the University of Toronto and at Ryerson, my approach was similar. I proposed questions that I was confident were worth considering seriously, and I supported my students’ efforts to think deeply about them. I aimed to be available, responsive, and encouraging. The point was never to train future history professors; it was to provide a platform that would inspire deep learning. The historians that Booth spoke suggested that “[t]here is no secret formula for successful teaching” (105), but there is in fact plenty of research that highlights practices that promote student learning more effectively than others. This is, of course, the basis of STLHE. The problem is that these practices require more time and effort than many academics have traditionally been able or willing to allocate to the classroom. I wish I could say that this has to change, but the academic incentive structure – not to mention our collective unwillingness in Canada to follow the lead of our American historian colleagues and develop a discipline-wide consensus on measuring learning outcomes – suggests that it won’t. For likely more than one reason, the historical profession in Canada seems to have a conservative approach to teaching and learning. It is my hope that series like this one on activehistory.ca, the new attention being paid to teaching in the Bulletin / Intersections, recent attempts to commission scholarship on teaching (Confederation) in the Canadian Historical Review, and a new generation of scholars who have come of age at a time when the overwhelming majority of history students will not go on to careers in the discipline will finally spur our community to turn the corner on teaching and learning. Our students deserve it, as does Canadian society. Adam Chapnick is a professor of Defence Studies and the deputy director, education at the Canadian Forces College in Toronto. It’s worth noting that the “discipline-wide consensus on learning outcomes” is a grant-based project of the disciplinary association rather than a grass-roots development, a defensive adaptation to the rise of assessment rhetoric in the wider world of program review and accreditation, and that some of us who have been through the training are deeply skeptical of the soundness of the approach. Teaching matters, and learning matters, but it’s not clear that we have a firm grasp on evaluation and measurement of the results of our work.